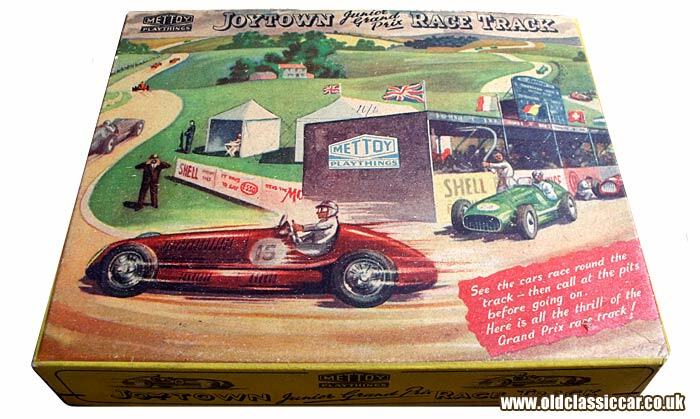 The Joytown "Junior Grand Prix" tinplate racing game, by Mettoy. Homepage. 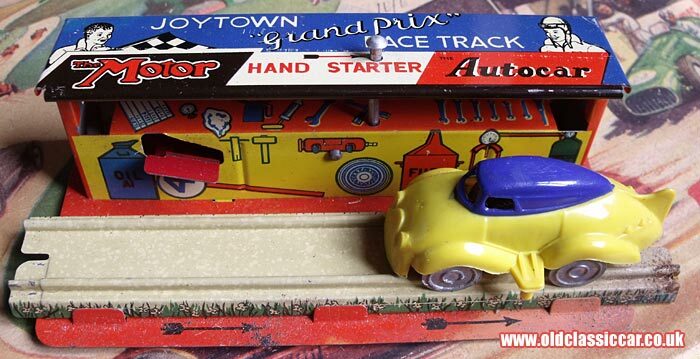 This page: A boxed original set of the Joytown racing cars, pits, and tinplate track sections. The Joytown "Junior Grand Prix" Race Track. Some years ago this boxed set of the Mettoy Playthings Joytown Junior Grand Prix Race Track turned up at a toy fair, and was swiftly acquired. 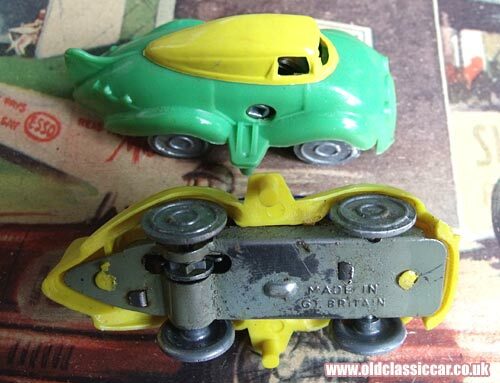 The set is un-dated, but the contents, which are a mixture of tinplate and plastic, with two clockwork racing cars of very futuristic design, suggests early-mid 1950s to me, and the cars on the box lid back that theory up. "See the cars race around the track - then call at the pits before going on. Here is all the thrill of the Grand Prix race track!" The lid features very appealing artwork, with a variety of 1950s racing cars and drivers hard at work, tackling the undulating circuit. A green car prepares to exit the pits, while another red car waits to have its wheels changed. Union Flags flutter patriotically alongside those of their continental neighbours, and a member of press stands close to the edge of the track, determined to capture the drivers' expressions as they hustle their charges through the first, right-hand, turn. To add realism to the scene, advertisements for Shell and Esso fuels, plus those for Autocar and The Motor magazine, decorate the pit area. 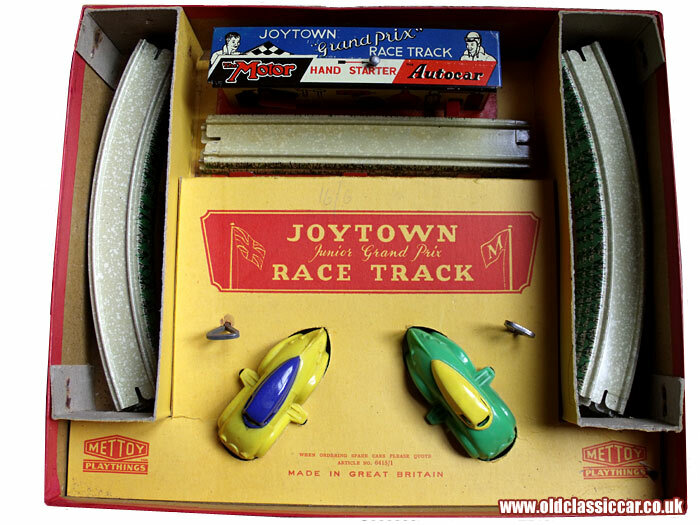 The Junior Grand Prix set was one of several "Joytown" children's games, others included a fire brigade set, a service station and two cars, O gauge railways (station, loco shed etc) and more, in addition to all the other tinplate toys that the British firm was producing at the time. I've seen a couple of variations of this Mettoy (ref. 6415) set, but both are basically the same in that they come with two clockwork racing cars, curved and straight pieces of lithographed tin-plate track, and a very smart pit area, again in tin. All are neatly presented within the box, while two original keys take care of winding up the racers' motors. The pits section is especially neat, featuring lithographed artwork to all its sides, including the base. The front, outside of which the cars pull up for fuel, is decorated with a large fuel can, oil container, fire extinguisher, tyre inflator, while within the pit garage is a mechanic beavering away at his workbench, surrounded by tools. On the top is a "Hand Starter", which is connected to a couple of metal tabs sticking out from the front of the pit wall. The car is wound up, placed in the pits and held in position against the tabs. Pressing the hand starter releases the car. Observant readers will note that the car in the photo below is facing into traffic, rather than the correct direction which is opposite to the scene shown on the box lid. The rear of the pits features an illustration of a racing car coming in for a change of tyres. Given all the advertisements for Shell, Esso and Dunlop that feature in this racing game, I wonder if they contributed anything to its manufacture? The cars are each fitted with a small clockwork motor, fitted to the metal baseplate. The body comprises two pieces of moulded, coloured plastic, styled along the lines of a streamlined 1930's racer, or record breaking car. Whoever the lucky child was that received this as a gift in the 1950s, they were certainly well behaved as the parts that make up this set are in very good condition. Were any other motor racing sets produced by Mettoy for the "Joytown" series? Mettoy were prolific producers of toy cars, two of their other racing car toy designs can be found elsewhere on the site: a large metal clockwork racer, and a much lighter racer, again featuring bright coloured lithography.